I received this email from a friend today, and what this man needs seems very small compared to what he has done for us. Please email his teacher if you need more information or can help. I have a student who is a 13-year veteran of the Marine Special Forces. He is on 80% disability and is taking 25 credits at the community college with a 4.0 GPA! He is in significant pain from his years of service and is beginning to learn how to ride horses to help. He talks non-stop about "his horse" Hooch and their connection. 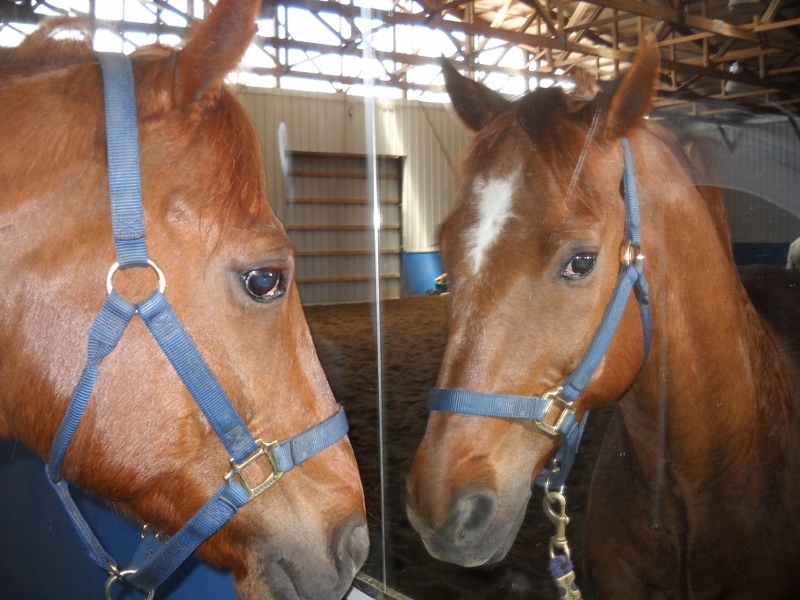 I see a huge difference when he comes to class having ridden or even just visited the barn. I know you all know about this!! The reason I'm writing is because he needs some riding gear and I thought maybe we as a group could find some solutions since his funds are so tight (VA benefits are slow to arrive). He is borrowing a helmet, but could really use some chaps - used are just perfect. So if anyone is or knows of someone ready and willing to donate a pair of used chaps that would be amazing! Every spring, a pair of wild geese returns to our farm. While on morning chores this weekend, my daughter caught this shot of the wild geese walking along the top of our old barn. You might also enjoy our wildlife photo album. Diversification project this year at Poudre River Stables: Edible cut flowers! You might also enjoy our Flower Farm photo album. Pasture grass can be very tough stuff. This is how the planned bed looked after only one pass with the tiller. A deer peeks out from behind a tree near our compost pile. Based on the report that Colorado's mule deer population has declined by one third in 10 years, this scene could become a rarity. The news that the Colorado mule deer population shrank by one third in the last 10 years comes as no suprise. The mule deer in our neighborhood constantly have to work to stay ahead of Man. Urban civilization, especially vehicle traffic and the development around us, can be hard on baby deer. I often find the deer hiding out on our property, as you can see in this YouTube video (also below) and they love to bed down on the compost pile. Tree planting is always a busy time at our place. With the Shields widening and other development projects on all sides, many trees are about to meet their maker. I am trying to repopulate elsewhere. In this river rock "soil" it can take hours to dig holes and plant a few trees. If you establish water however, they will thrive. Blanco, who played Shadowfax in 'Lord of the Rings', is gone. He was a beauty. Read the full story from his owner, Cynthia Royal, who valiantly tried to cure his mystery illness. The horses are among my favorite actors in Peter Jackson's 'Lord of the Rings' movies. Bill the Pony reminds me of a certain other, similarly-named horse, Billy the Morgan. Trivia: 'Lord of the Rings' could have used an equestrian continuity editor for scenes akin to when Aragorn was nudged and helped up by his horse, Brego, one moment in a bitless headstall, the next in a bit. Below, our Billy watching himself in the mirror. Click on the photo to see our album of all the other horses and what they learned last June at the Jackie Johnson horse trick-training clinic. Horse trick training: We got the pedestal!